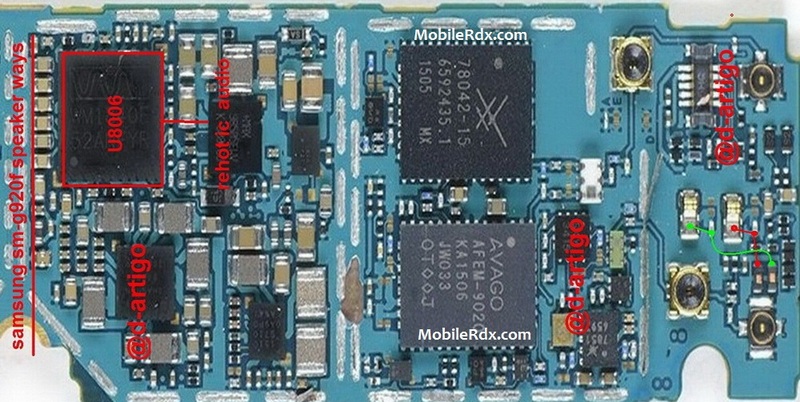 This post is for Samsung Galaxy S6 SM-G920F Speaker problem solution. If your Samsung Galaxy S6 G920F Loud Speaker is not working this post can assist you in getting rid of the problem. First of all please don’t confuse Speaker with Earpiece. Speaker is placed on the back bottom of the mobile phone and is used to play music, video games music or playing videos etc. Most of the times you get not loud speaker sound due to just misplacement of the Speaker module. It is not soldered on the motherboard and connects to it by springs. Sometimes those springs get damaged or out of place because you drop your phone. Here we will provide line ways Samsung Galaxy S6 G920F to your speakers, do the jumper speaker lines according to the instructions contained in the following schema. So if you are sure that Samsung SM-G920F Loud Speaker is in good working condition then here is a complete how to troubleshooting guide for your mobile phone. Please study these diagrams very carefully before you start repairing.